The introduction of invasive species through the ballast water carried in ocean-going vessels is one of the biggest threats to marine environments. The ESA is using weapons hundreds of miles above the ocean surface in this environmental battle. Ships need ballast to maintain stability and counteract high winds. The most efficient way to add and remove ballast is to simply pump water into and out of the ballast tanks. Unfortunately, ballast water added in one location includes thousands of organisms, larvae, eggs, and microbes. If the ballast tanks are emptied in a different location, all these organisms are introduced to a new environment, where they may have few natural predators. 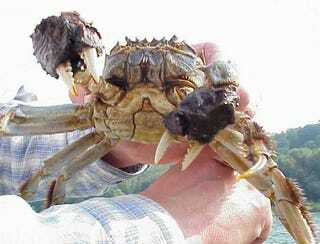 They can quickly overwhelm native species and screw up the entire ecosystem, like the Chinese mitten crab above has done to European estuaries. Unfortunately, water ballast is too crucial to just ban outright, despite the potential harm it causes. The European Space Agency has partnered with the International Maritime Organization and several national agencies to find ways to support the International Convention for the Control and Management of Ships' Ballast Water and Sediments, slated to take effect in 2013. Their solution is to track the areas most at risk from ballast-transferred invasive species, creating charts that tell mariners when and where it's safe to take on and unload water ballast. The key tool for this mission is the ESA's network of satellites. Determining risk involves modeling several different factors measured by satellite images. The first is water temperature, since colder waters tend to be hospitable to a wider variety of species (mainly due to convection currents which carry plankton and other nutrients to the surface). They can also compare water temperatures between ballast load and offload regions to see if it's compatible. The second factor is water color, which assesses the types and amounts of algae present in the water. This indicates how well the local food chain might be able to support introduced species. Finally, they measure water clarity and turbidity, a fairly direct indication of the amount of nutrients and small organisms present for introduced species to feed on. By combining this information, scientists can find areas where it is safe to unload ballast water, because the conditions there would tend not to allow any organisms to survive. They can even select specific areas where unloading is safe based on where the ballast water was taken on by finding conditions not hospitable to the organisms likely to be transferred. They hope to eventually funnel the data to a website that can provide real-time information on ballast risk. It may seem like a minor issue, but sustainability of ocean ecosystems and biodiversity depend on solutions like this.